After I bought my home, I was hit with the harsh reality of how much furniture really costs. I mean… I just spent ALL of my money on my home. Now I have mortgage payments. Crap. How am I ever going to afford the bold, bright furniture to make it look nice? I have been there… trust me. And I know that the LAST thing you want to do is drag all your IKEA furniture from your apartment into your beautiful new home. It doesn’t work. And… it makes you feel… a little sad inside. That’s a question I’ve probably typed into Google like… a zillion times. Well, I’ve finally taken the plunge and I’m never going back. 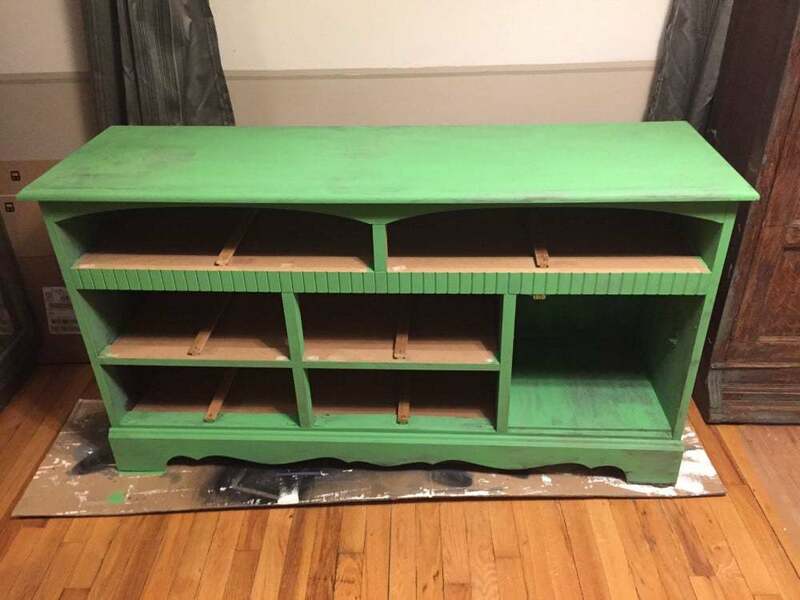 I seriously want to paint every piece of furniture in my house using this technique. it’s so EASY…. and so FUN… and the results are AMAZING. Rags. We have always have these white rags on hand. Chalk paint in whatever color you’d like. 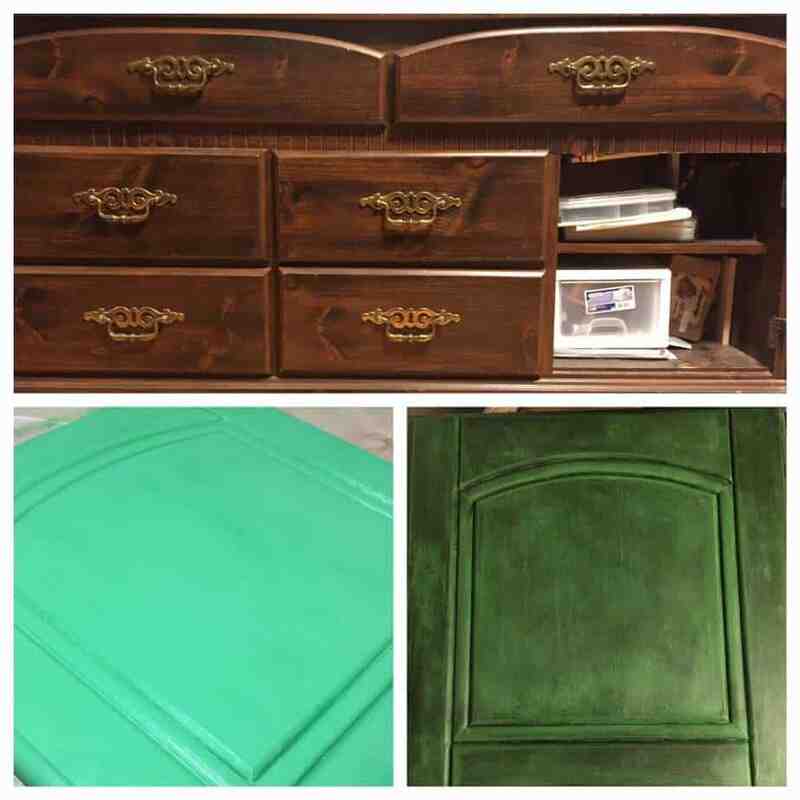 I used Annie Sloan, Antibes Green for this project. You can make your own chalk paint using my tutorial. 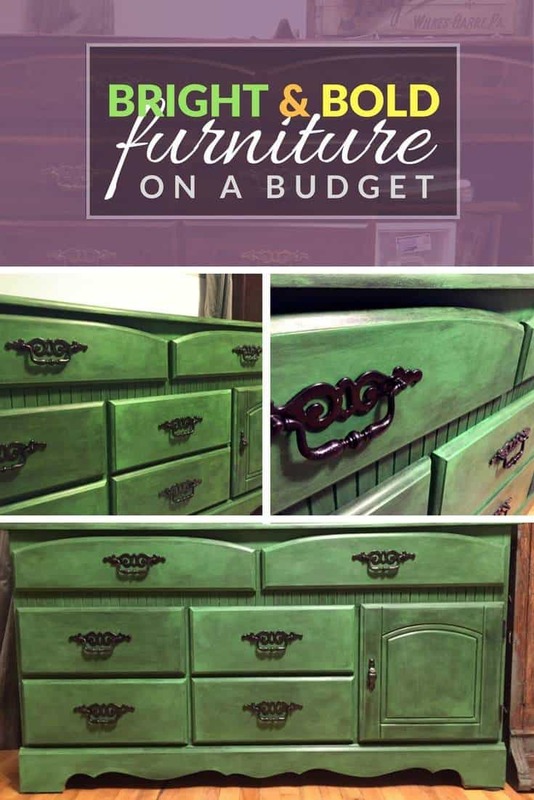 I’ve made my own and I’ve used several varieties of chalk paint… I really don’t see much a difference so if you’re on a super tight budget make your own out of a color you already have! Clear wax AND Dark or Black furniture wax. I used Annie Sloan BLACK wax. I’d really recommend this brand, although there are lots out there that are cheaper, and Annie Sloan is difficult to find sometimes. This is mine. A hand-me-down dresser I was using for extra storage. It’s actually my childhood neighhbor’s bedroom dresser that I swiped up when they were getting rid of it. The dresser itself is in amazing shape. But… it’s just old and not… pretty. It’s not real wood, it’s a veneer. This type of furniture is perfect for this project. If you don’t have a piece like this, you can use one of your IKEA end tables… or scour Good Will, Craigs List, LetGo, Facebook Marketplace and the like for something really cheap. Just make sure that it’s in good shape so you don’t have to spend time making repairs to the veneer or wood. Trust me on this… this project is super fun and easy, but if your furniture isn’t in good shape, it won’t be so fun. Chalk paint can be applied to any surface to make a durable finish. The best part is how little prep work there is! They actually don’t even recommend sanding the surface first… but honestly if you have a high varnish, slippery surface your are better off doing a quick sand before you start. Wipe it down, then begin applying the chalk paint. You can be pretty sloppy with this. I’m the sloppiest painter ever… and it came out nice for me. The biggest thing is to get the paint into all the nooks and crannies. I applied 2 coats of paint to my dresser and drawers to get most of it covered. You don’t need a super perfect finish, like I said… just make sure you get most of the surface covered with a layer. Ok…. the color is bright. I bet if this were you, you’d be having a freaking heart attack right now. I agree, this color is ugly…. BEFORE the final step. My experience has been to pick gaudy colors for this technique. Those candy colors that are too bright to put on the walls…. a shade or two too saturated. Once you’ve got your piece painted, let it dry overnight, you can sand along the edges of the piece to remove some of the paint to create a distressed look. The best way to do this is the think of the places the piece would naturally wear over time… near the knobs and handles, along the edges where someone may touch it or set something onto it… and also along the “detail” parts that you want to highlight. I skipped this step… for the most part… except for getting a couple huge gloppy pieces off (messy painter). So, you don’t have to do it but a lot of people do distress before waxing. This is the fun part. In order to use a dark wax or a black wax, you first have to apply the clear wax. Annoying, I know. But this will seal the piece so that the black is way easier to work with. Luckily I’ve found a time-saving secret to avoid this… mix the black and clear waxes together! Grab a spoonful of the clear wax and a spoonful of black wax and mix them together in a cup or on a paper plate. Make sure they are mixed together well, and then you’ll only have to apply this wax once. If you choose to do them separately, make sure that you put the clear wax over every square inch of the piece, then wipe the excess with a rag. Then, you’re ready to apply the black wax. Rub your waxing brush or rag into the can of black scary goodness. Then just rub it into your furniture right over the paint. I started at those “Distressed” areas… inside of the detail parts and where I wanted the wax to be darker. Then I took a rag and just rubbed the black into the whole piece. It dries quickly so I wouldn’t recommend leaving it on too long like you would with a stain. You’re better off applying and wiping within 2 minutes — so make sure you work in small sections. If you have a spot where you think you applied too much dark, don’t worry…. just take some of the clear wax and rub it over the black wax. It acts like an eraser and it will simply remove all of the dark from that area. Apply and work the wax around until you are happy…then buff it until it’s shiny and there’s no residue. 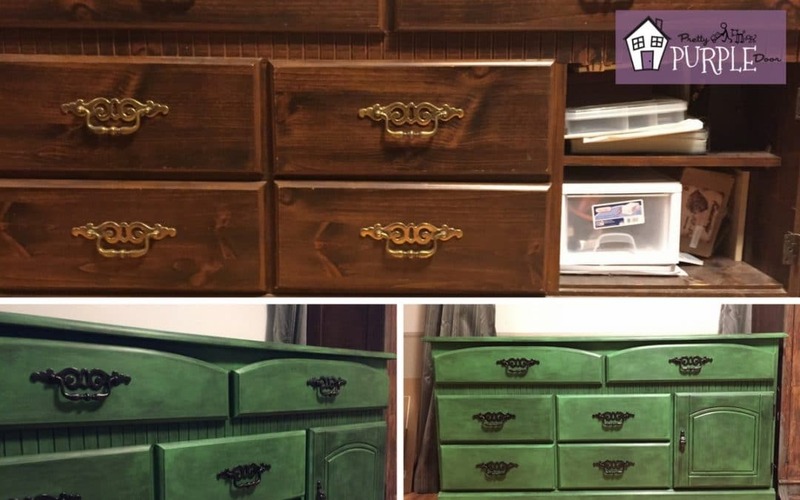 Here’s another project I tackled with chalk paint. On my bathroom vanity, I used a very pale blue and then distressed using the same technique with black wax. 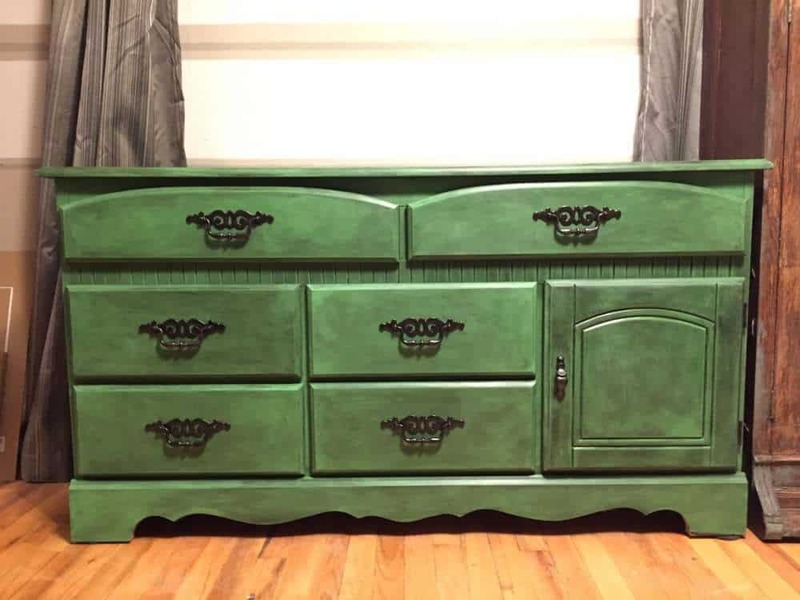 It’s not as bright and bold as the green dresser, but it really makes a big impact. Read more about it here. The last and final, again optional, step is to spray paint the hardware. I just soaked my hardware in some paint thinner (whatever I had laying around)…. and dried it. Then I used a can of “oil rubbed bronze” spray paint to freshen up the pulls and hinges. It really made a HUGE HUGE difference and I’m so happy I did it. So, that’s it! What a quick and easy way to add some charm and character to your new home! Other than waiting for the paint to dry overnight before applying the wax, this project can be done really quickly… within a couple hours over the weekend! Just lightly sand your piece, then apply your chalk paint. After sanding and distressing key areas of the piece, apply a black wax mixed with a clear wax to the entire piece. Rub off, buff your piece, and be AMAZED at this beautiful result. 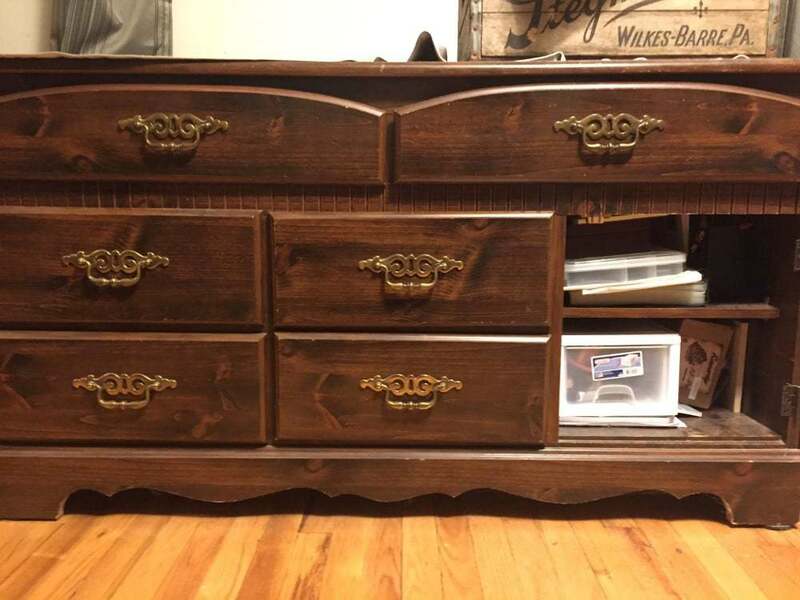 I am still staring at mine, wondering how it looks like there’s so much texture and antiquing to a plain old veneer dresser. It truly does work, and it looks incredible. It’s really one of those can’t screw up projects. Let me know if you have any questions. And I’d love to see your furniture makeovers in the comments! 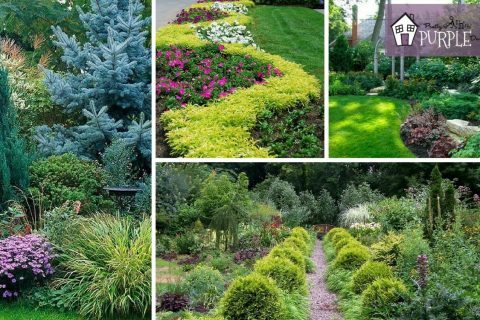 Choosing a purple front door for your home has important meanings. 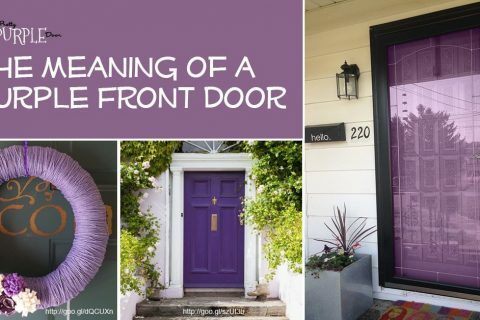 This post will explain why you should paint your door a purple front door. 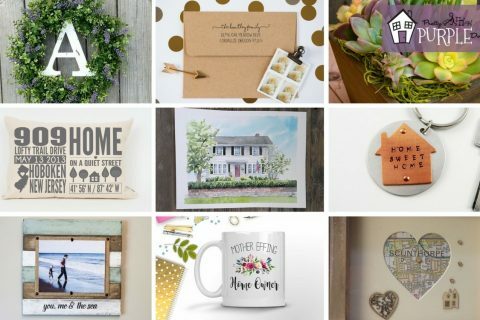 Unique home owner gift list including home blessing printables to help you make the PERFECT DIY housewarming gift.